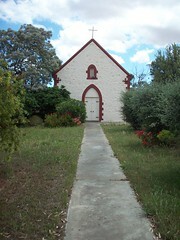 St. Peters Anglican Church is located in Aerodrome Road, Mallala and was licensed in September 1884 by Bishop Kennion, second Bishop of Adelaide. Rev W.F. Marshall was priest of the new mission district which included Dublin, Two Wells, Wild Horse Plains, Port Wakefield, Goyder and Balaklava. From retirement in Perth he made the following remarks: " Fifty miles on horseback on a Sunday with three to five services spread widely apart was nothing unusual in those days. Often the round trip was made without a solid meal until 9 pm." St Peters is a tranquil and hallowed building and to tell the story of loyal members down the years one has only to read about the donors of the furnishings. The congregation declined over the years and the church was placed under direct control of the Adelaide Home Mission Society which provided the priest. In the year 2003, the congregation was assisted by a grant from the Ministry Development Council for the purpose of providing a priest. In 2009 the Mallala and Two Wells Anglican congregations combined for services which alternate weekly between the two towns. They are now a dedicated, progressive and supportive group. "Life Around the Light" A History of the Mallala District Council. Do you remember St Peters Anglican Church ? Then Join up and add your memory here.